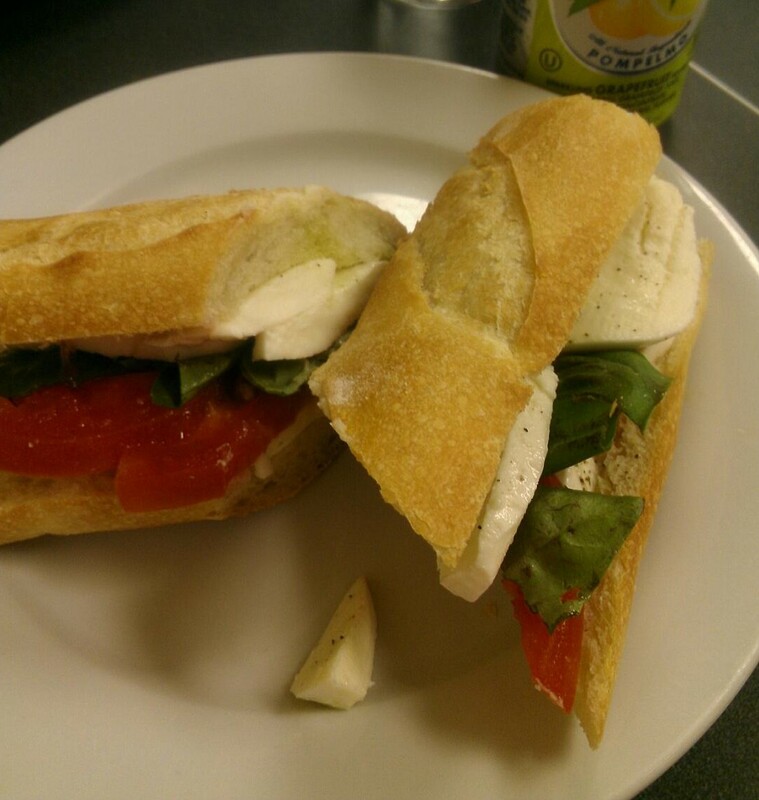 DiPasquale’s Italian MarketPlace – eating my way through Charm City! I have to admit, I was a little confused when you walk in. There is a counter with a cash register immediately to the right and there are dining tables straight ahead. As you walk towards the table, the walls are lined with drinks – beers, soda, and wine. Off to the right, you can see the deli counter. Oh, my… the deli counter. Olives, roasted and grilled veggies, octopus and calamari, and slices of their famous lasagna. I went for lunch on a relatively hot day – so no lasagna for me. 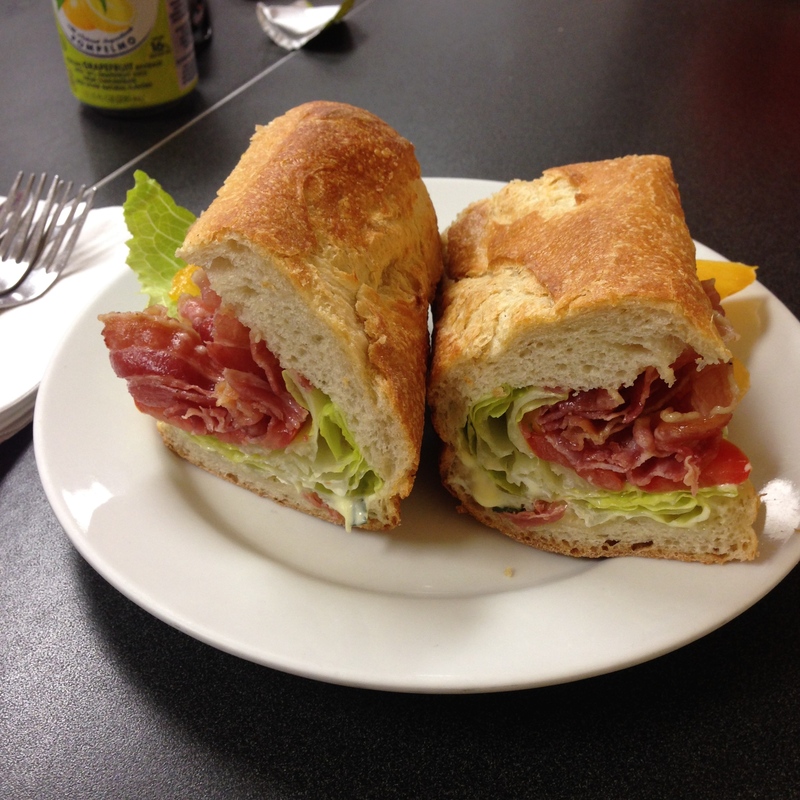 I had a hard time choosing off the menu – prosciutto melt? their version of a cuban sammie? caprese? Finally, one of the folks there recommended the PLT from the specials board. This is not your normal BLT with a pancetta substitute. That is a glorious crunchy toasty baguette slathered with a zesty herbaceous aioli and with layers of crisp lettuce. Is your mouth watering yet? I can’t decide which I liked best: the flavorful red and sweet yellow heirloom tomatoes, or the perfectly cooked crumbly, flaky, salty pancetta. Take your pick. I want 97 more. All of that for under $8 – what?! what?! Now, my friend immensely enjoyed her Marcella Caprese sammie. She often chooses anything with fresh mozzarella and basil. It came on a little different bread – but similar crunchy and chewy and italian style, with fresh mozz, tomatoes, tons of basil and olive oil. Very good – she didn’t even share… But, not as unique as my PLT. My friend also took home some of their grilled eggplant and camponata – which both looked and smelled amazing. This entry was posted in Brewer's Hill, Canton, Charm City, Highlandtown, Hooray!!! Winner!, Lunch. Bookmark the permalink.